After a month in Lao, our last foray was six hours north of Luang Prabang by boat to the sleepy town of Muang Ngoi Neua with my parents. This is where I fell in love with Lao. 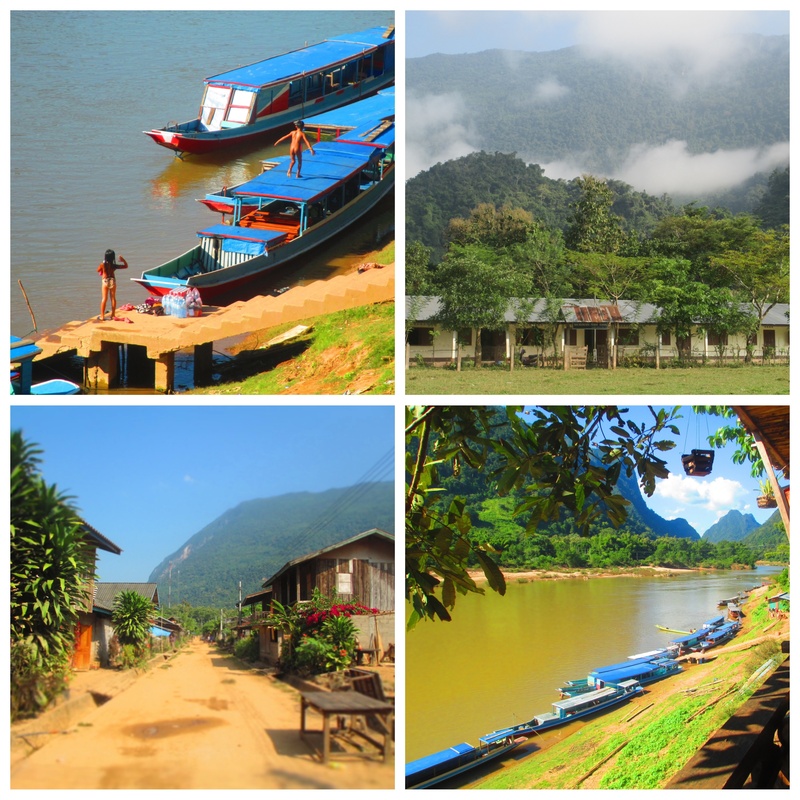 The village sits on one short dusty road surrounded by thick green mountains — baby sisters to Rio’s sugarloaf — while the Nam Ou river flows by. We spent two nights there and it was snapshots of memorable moments, beginning to end. I watched two boys, about nine, run to the river edge at dawn, strip to their underwear, soap up and scrub down before turning their attention to washing their clothes. We scrambled up a mountain to a vast cave, stunned silent by the size of it and the thought of hundreds of villagers hiding there huddled together while listening to the bombing of their village as the Vietnam war bled into Lao. Meals were leisurely as single proprietors greeted, cooked and served the tourist crowd. We learned to bring cards, books and a chill attitude to any meal. A few BeerLaos helped too. We met a most mellow couple from Denver…on the road for 17 months and not planning to leave it anytime soon. I could tell they had their travel rhythm…the ability to just BE in your surroundings vs our continued itch “What’s next? Do we like this?” In the end this couple also became our benefactors as there is no ATM in Muang Ngoi Neua and despite knowing this, we somehow did not travel up river with enough kip. Phyllis and Jared lent us enough money to eat in style and get home safely. When we returned to Luang Prabang, mom left reimbursement for them and they left inspiration for us. The river. Oh the river. 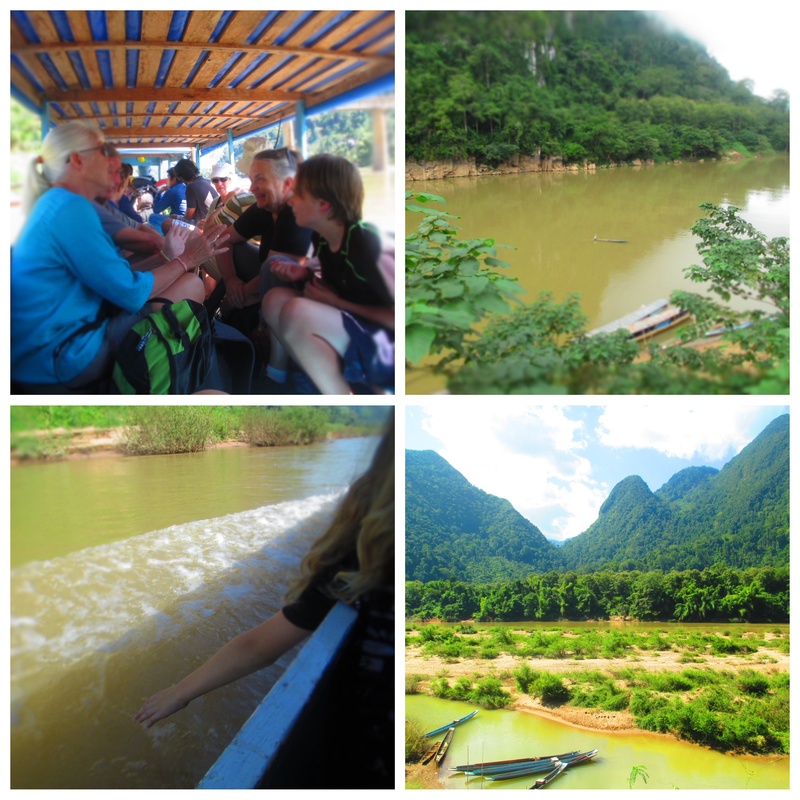 We returned to Luang Prabang by a five hour trip in a longboat down the river. I could not get enough of the rich colors — the longboats painted primary colors, the bursting greenery traveling up the mountain ranges, the silk browns of the river and dusty browns of the shores. The river life in full display — the water buffalo escaping the sun, the villagers fishing, the children playing — one even taking time to wave hello and then bend over in full moon position until we passed (we debated a bit whether one could be mooned if the mooner was naked to begin with). The many garden patches along the shore — so neat, so newly green, so virgin. Having three generations on this trip made it even more special and as we merged from the Nam Ou River to the impressively big Mekong, I thought about what an incredible memory this was for my children…to sail down the Mekong River with their grandma and papa. Who does that? Well…besides the locals. We stayed at Lerdkeo Sunset Guesthouse. It’s the newest group of standalone bungalows (five total) along the river and one of the last accommodation options if you turn right on the main road. It’s also the most expensive and you can book it on Agoda, which was helpful as we needed three rooms. If you plan to take the early boat up, there’s little reason to book ahead except in the busy season (Dec-Mar). If you take the later boat, it would be wise to book in advance. Lerdkeo lacks the must have hammock and hot water was infrequent but the room was nice, views beautiful, and pancake and fruit breakfast on our balcony each morning just right. We ate almost exclusively at the Riverside. The proprietor speaks a little English and had helped me through a language barrier dance with the guesthouse staff (“I paid online…Agoda? You know? Internet?” Blank stares.) The food was good, not great but satisfying and the atmosphere was the best of all of the riverside restaurants we tried. Ask for the pumpkin curry and request that they amp up the spice. To get to Muang Ngoi Neua, we rented a minivan from Luang Prabang to Nong Khiaw. I was quoted 800,000 kip for six people from one of the many travel agencies in LP. We ended up paying more booking through my mom’s hotel as we wanted to be sure we had a good driver and seat belts. Of course in the end we had neither. Whiplash and barf bags a plenty. 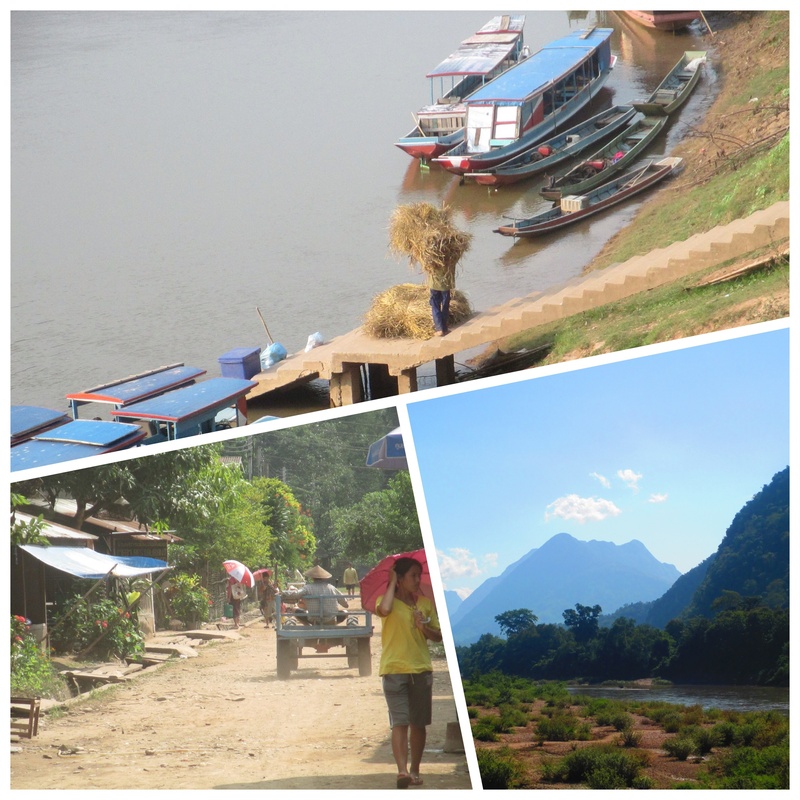 Once in Nong Khiaw, we took the 11AM boat — it took 1-1/2 hours and cost 25,000 kip per person. 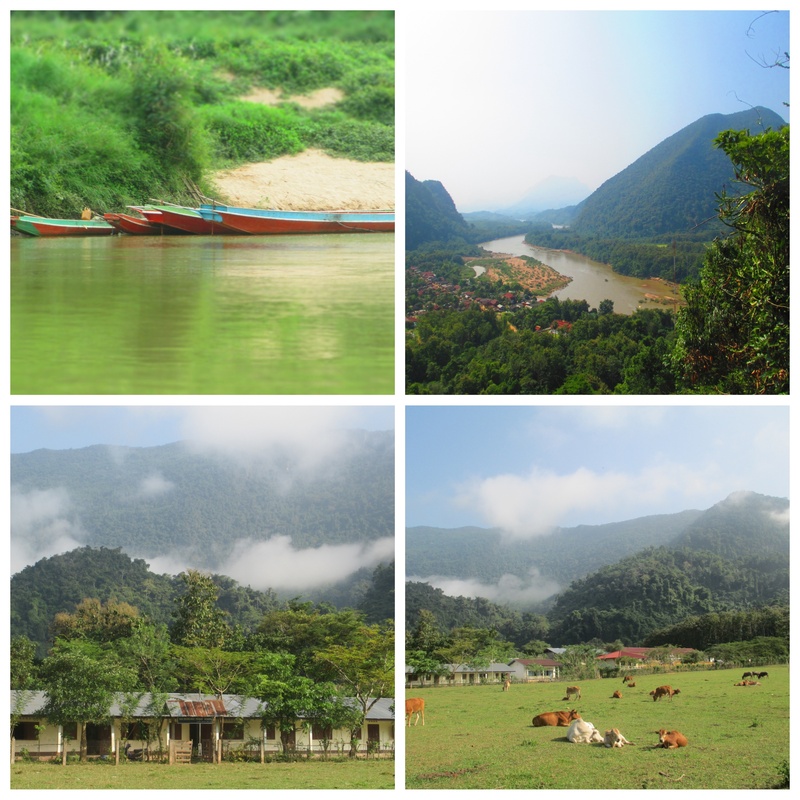 We heard there is a road now to Muang Ngoi Neua but why miss the beautiful river journey? After seeing many a weary passenger disembark the boat from Luang Prabang, we decided to arrange for a private boat with minibus seats back versus sitting on a wooden bench for six hours with twelve new friends. We had been quoted 1,500,000 kip in Nong Khiaw. In Muang Ngoi Neua, we arranged a boat for 1,800,000 kip, all in all 150,000 kip (or $19) more than if we’d taken the public boat back to Nong Khiaw. The owner of Lao Youth Travel arranged this for us and we had some trepedation about handing over 1.8M kip two days before our departure (he was heading out in a trek and needed to pay the boat driver) but it all worked out fine and the owner called the driver a few times during our boat trip back checking in. Don’t do much! Bring a good book. Buy more at the cultural center or swap at a guesthouse. We left electronics in Luang Prabang and supplemented at the cultural center with a puzzle book for Sean, dogs personality book for Julia and a history book on the mayflower for Kyle. See the caves. There are three…two that you can see simply continuing to walk on the road past the school and one that takes an adventurous route behind the Wat and up a steep mountain climb. If you take the latter, you’ll be rewarded with great views. Bring books from Big Brother Mouse and drop them off at the school. Walk past the caves to visit waterfalls or villages further afield. Leverage Lao Youth Travel for organized treks and kayaking trips. Chill, watch the river life, play Uno, breathe. Thanks for sharing your experiences traveling as a family! Laos is high on our list of places that we would like to visit.